It would be nice to say that Fennec has really been coming along of late. But honestly, from an end-user’s point of view, that’s not really the case; it’s still a massive memory hog, crashes seemingly at random, and takes up an inordinate amount of your phone’s internal storage. However, it is definitely growing gradually more usable, and beneath the rather sluggish front-end, some serious changes are taking place. If you've been following Mozilla Mobile dev @mbrubeck, you may have read about some under-the-hood improvements going on lately, as the internals of the browser undergo a complete reworking. Yesterday he posted a description to his blog of the advancements still to come as Fennec transitions from v1 Pre-Alpha to the v2 Alpha on Android. The main update of note is the integration of Electrolysis into Fennec 2. Simply put, Electrolysis separates the processes handling the webpage content and the browser UI functionality, meaning your toolbars won’t suddenly become unresponsive when you’re loading a heavy webpage. Little touches like this make the browsing experience feel smoother and faster, whilst adding to stability. Fennec 2 will also bring a new rendering engine named Layers, which will incorporate hardware accelerated processing of the page canvas laid out in the page’s HTML. One of the really novel features in Fennec is its gesture-based toolbar paradigm. Further changes to the UI are planned, like the modestly-named AwesomeScreen (derived from PC Firefox’s AwesomeBar), which will poll social network sites like Facebook and label the website’s URL entry with a count of the updates since your last visit. 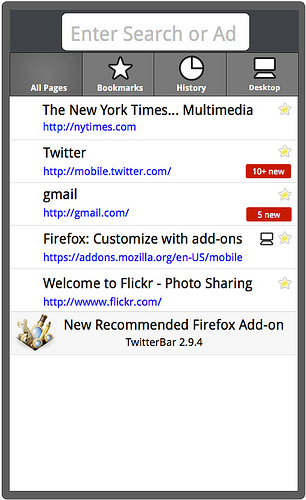 Combine that with Firefox’s history sync and you have the potential for some pretty powerful Continuous Client magic. It’s the kind of integrated experience that makes Chrome2Phone pretty simplistic by comparison. You may not need a Facebook or Twitter client replacement, but what about a label on your favourite Android news site’s bookmark showing how many posts since you last visited? On your computer? With Fennec’s add-on capabilities this is possible and - one would hope - only a matter of time. Fennec 2 will also tap into local system information with insertion of phone numbers from your contacts or e-mail addresses on web forms. On the hardware side, it will leverage the multi-touch API for page-navigation gestures like Home and End or going forward and back between pages. While two-handed operation is somewhat uncomfortable on a phone, it’s a good feature for the tablet-laden future of Android (unless said tablets have resistive touchscreens…) and will make casual browsing more intuitive. If you’re interested in following the progress of Fennec, you can download a nightly build from the Mozilla servers. The installation is approximately 30 MB so you may have to delete some applications to make space. Users with Froyo installed can partially move Fennec to SD, reducing the footprint on the internal memory to around 20 MB, and the final plan is to fit the whole package in beneath that 20 MB mark. Fennec currently only runs on ARM v7 (Cortex A#) processors, so phones with internals pre-dating the DROID are so far out of luck. The pre-alpha version of Fennec will soon enter a “code-freeze” where the major bugs are ironed out before the transition to the alpha version. You can read up on the further plans for Fennec on the Mozilla Wiki, or check Matt Brubeck’s full blog post at the source link beneath.